Well today they were, I think I fell in love with piping roses. There was something therapudic about it, maybe it was because I was picturing how they would look on the cookies I was making for my client. I just wanted them to dry so I could use them right away! 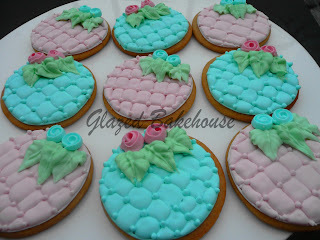 These cookies were for a 60th birthday, I loved the colour combination, pastels are always beautiful.